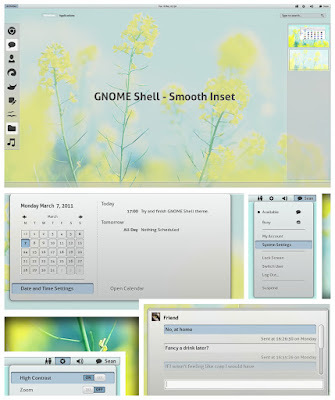 The theme only works with the latest Gnome Shell from GIT (at least version 2.91.90) - check out or Gnome Shell Ubuntu 10.10 installation post if you want to build the latest Gnome Shell from GIT. Unfortunately there are no built-in settings in Gnome Shell to allow changing the whole Shell theme so to install it you'll have to manually copy some files to the ~/gnome-shell/source/gnome-shell/data/ folder. Hopefully this will change soon. I expect to see a lot more amazing themes for Gnome Shell once Gnome 3 will be released because anyone with CSS knowledge can do it: it's all CSS and images.